A delightful French food gift box from Brittany! Make your summer holidays last a bit longer with a generous gourmet Breton spread. This month, La Gourmet Box invites you to discover the Côtes d’Armor region, home to one of France’s most breathtaking coasts—the Côte de Granit Rose or Pink Granite Coast—and a land of magnificent cuisine. Saint-Brieuc Bay and its scrumptious scallops, Kerarzic oysters and more ocean delicacies, apples, ciders and other gourmet derivatives like Chouchen, butter, famous Breton crêpes (of course), salted-butter caramel, biscuits... Brittany is a veritable foodie heaven. You simply can't afford to miss out on this gourmet box! Artisan: Cidrerie artisanale du Léguer. 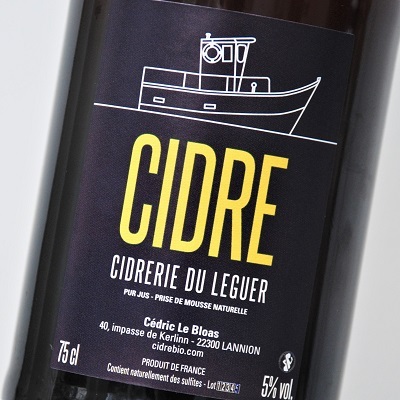 Cidrerie du Léguer runs an organic apple farm where chemicals are banned from the orchard. In fact, human involvement is limited to mowing the grass and pruning the trees. Pests and disease are managed by biocontrol, boosting their natural enemies. And these wholesome apples produce an all-natural cider that’s out of this world. This organic cider is a blend of 15 sweet, sweet-tart and tart apple varieties, much like many wines are a blend of different grape varieties. Striking a subtle balance between the characteristics of different apples is the secret to making a truly outstanding cider. This premium cuvée was created for connoisseurs and gourmands who can appreciate the delicate nuances of a great cider. But even amateurs will enjoy its fruity, not-too-sweet freshness and long, intense finish. Artisan: Chouchen d'Armor, Apiculteur Patrick Gouedard. 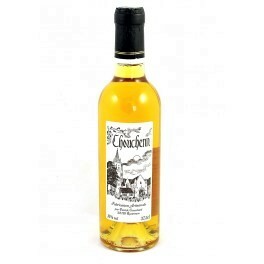 The Breton mead known as Chouchen is an alcoholic beverage made by fermenting honey in apple juice or cider. In ten days, the same yeast strains used to make the famous Sauternes wine turn honey into alcohol. The mead is then aged on its lees in barrels for 12 to 18 months, letting its delicious flavours and aromas mature over time. Made using traditional methods, this Chouchen vinegar is perfect for adding a splash of originality to your salad dressings, glazing your duck magrets or giving your fish dishes a delicate hint of sweetness. Artisan: Conserverie artisanale Ker Lagadeuc. 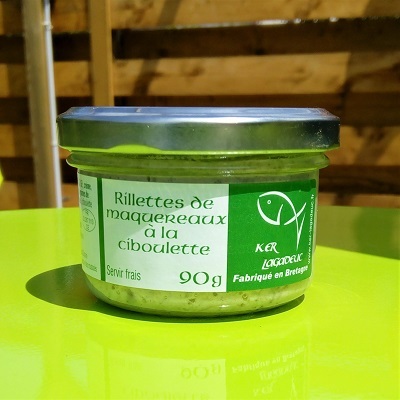 Ker Lagadeuc, an artisanal firm in the Saint-Brieuc region, brings us these delicious seafood rillettes made using only the freshest fish. And with this mackerel variety, you can taste the freshness from the very first bite. A must at any Breton table! 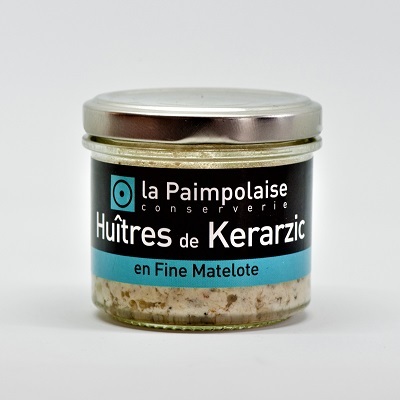 Artisan: Conserverie artisanale La Paimpolaise. Kerarzic oysters thrive along the wild coasts of Côtes d’Armor, near Paimpol. Cooked with onion, leeks and tender carrots, their salty flavour and rich, creamy texture delicately caresses the taste buds, unaided by artificial additives or preservatives. Our artisan has managed to capture all the fine freshness of oysters in this delicious snack spread. Try it on Melba toast for a genuine treat! Artisan: Ferme agricole de la Grande Lande. Jean-Noël raises his hogs in the picturesque town of Plélo, far from industrial food factories. The three pillars of his business are respecting the environment, ensuring the welfare of his animals and feeding them a healthy, diversified diet (linseed, a natural source of Omega-3, wheat grown on Jean-Noël’s farm, etc. ), and the wisdom of this philosophy is apparent in the inimitable flavour of his pork. You’ll see for yourself when you try this artisanal gourmet spread, mixed with algae from the rugged Breton coast to give it a truly elegant taste and creamy texture. An amazing discovery! Located in Guingamp, in the heart of the Côtes d’Armor region, the artisanal family-run cannery Crust’Armor turns local ingredients into delicious seafood spreads. 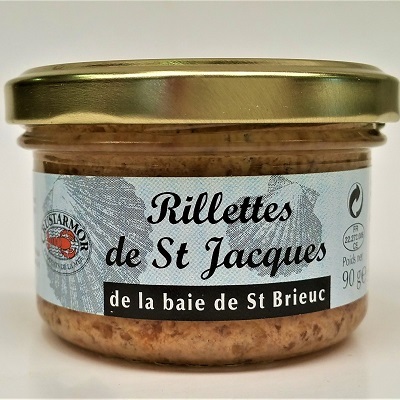 Made from Breton scallops, these light rillettes are packed with chunks and flavour: sweet crème fraîche and herbal aromas really bring out the superb taste of fresh scallops. 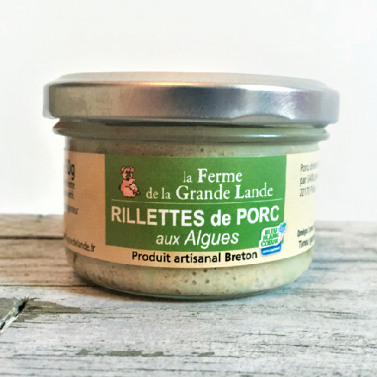 We can’t get enough of these rillettes! Obviously, you can’t visit Brittany without trying one of its signature crêpes! We thought finding one with foodie-worthy flavour that travelled well would be next to impossible... fortunately, we were wrong. Mary Jeanney has achieved the unthinkable: preserving a superb crêpe in a jar, made entirely from local, seasonal ingredients and prepared the old-fashioned way. We chose the great Breton classic, the galette-saucisse or sausage crêpe (sometimes called the Breton hot dog). 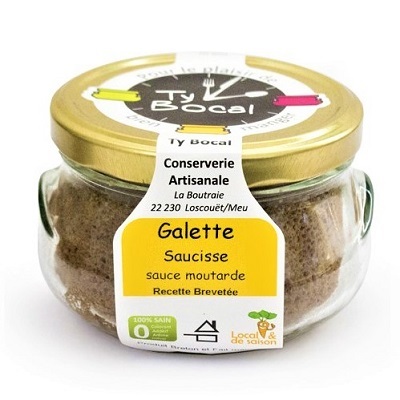 Open the jar, heat 1 minute in the microwave and sit down to savour a delicious piece of pure Brittany! Artisan: Caramélier et Confiseur breton L'Ambr'1. 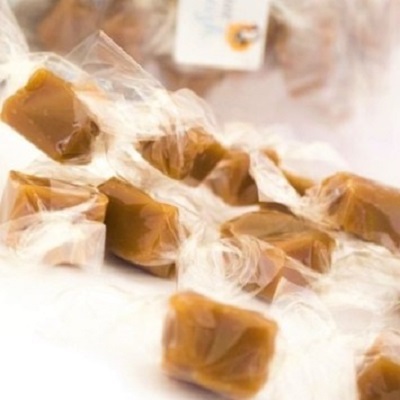 These salted-butter caramels were made from the finest local products by true artisans who started out in their garage, just like us. Texture, flavour... sheer delight! The addition of organic buckwheat seeds to the salted-butter caramel mix creates a crunchy-smooth contrast that makes these sweet morsels unique. 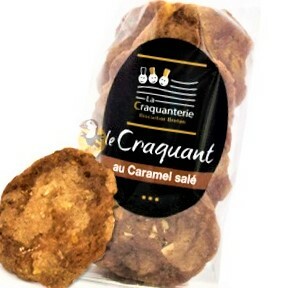 Frédéric Adam, founder of the Biscuiterie de Bretagne, managed to come up with a delicious recipe for crisp biscuits made of flour, sugar and egg white but no yolk—an amazing fat-free delicacy in the land of butter and Kouign-amann. And so the Craquantin Breton was born. Some years later, he added salted-butter caramel to the mix, and it quickly became an icon among Breton biscuits. With the bonus of hazelnut slivers, these little temptations are sure to delight all sweet-toothed gourmands. Bon Voyage in Brittanyl ! J'ai reçu ce coffret des Côtes d'Armor comme premier coffret de mon abonnement et je dois dire que c'est enthousiasmant pour la suite... très jolie présentation et moi qui vait chaque année sur la Côte de Granite Rose, j'ai découvert des produits délicieux que je ne connaissais absolument pas...Les rilletes de maquereaux ont une fraîcheur superbe, le cidre est très fin, les rillettes de Saint-Jacques je n'en parle même pas et j'ai été aussi positivement surpris par le tartinable d'huîtres... Très bon signe pour la suite ! Every month, we have our new gourmet boxes tested by independent testers (we don't pay them! We just ship them one of our new gourmet basket…), specialized in the world of gourmet boxes to get external advice (we would obviously put 10/10 each time...) and make our latest gourmet baskets known, because we are proud of them, and because we must play the game of criticism.... 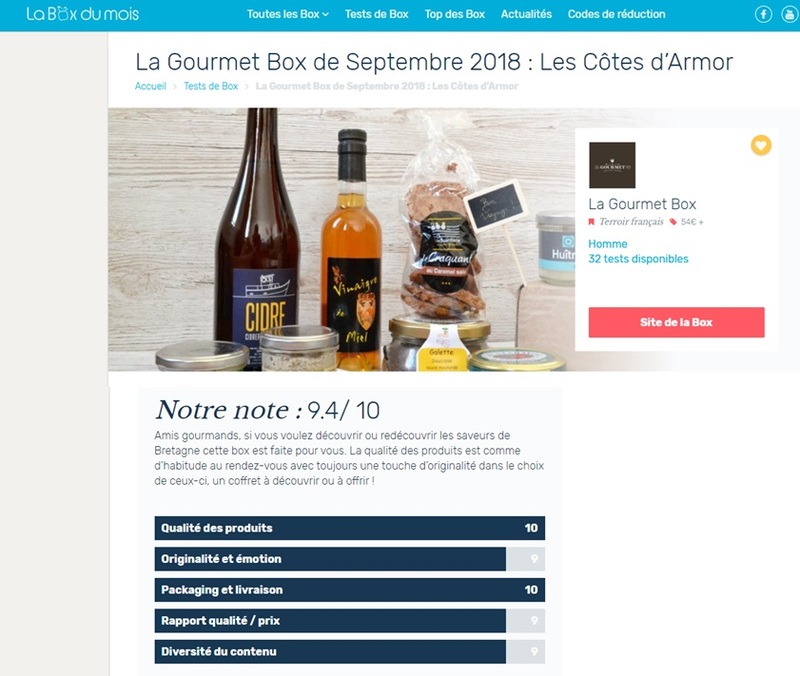 This month, our Brittany food and cider hamper in La Box du Mois website: good rating !